This cover was posted in Rotterdam and addressed to Batavia in the Dutch East Indies. It was carried on the P&O Steamer Malabar bound for Hong Kong. The ship parted hawsers in a gale in the Harbour at Galle in Ceylon on 28 May 1860 and ran aground striking rocks. Eventually she broke up in July that year. After a long salvage operation, all the cargo was recovered. 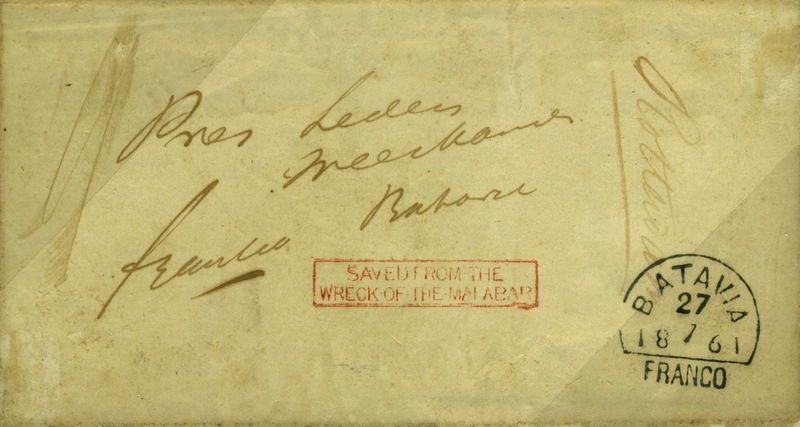 The cover received the red boxed SALVAGED FROM THE / WRECK OF THE MALABAR which cachet was not recorded in the Proof Book at the GPO in London until January 1861. After receiving the cachet strike the cover would have again been shipped to the Far East to reach its destination on 27 July 1861, some 15 months after posting.